The high-performance SDD detector and optimized hardware achieve a high level of sensitivity, analysis speed, and energy resolution that were previously unattainable. The EDX-8000 system also permits detection from 6C. The high-performance SDD detector and combination of optimized optics and primary filters achieve previously unheard-of high levels of sensitivity. The sensitivity is higher than the previous Si (Li) semiconductor detector across the entire range from light to heavy elements. The high fluorescent X-ray count per unit time (high count rate) of the SDD detector permits highly precise analysis in a shorter measurement time. 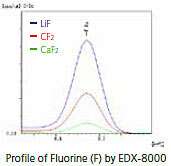 This feature is achieved to the maximum when analyzing samples that generate a lot of fluorescent X-rays, such as samples with a metal as the Main component element. Extending the Measurement time to increase the fluorescent X-ray count can improve the precision (repeatability) of X-ray fluorescence spectrometry. The EDX-7000/8000 incorporate a high-count-rate SDD detector that achieves highly precise analysis of the target in a shorter Measurement time than the previous model. 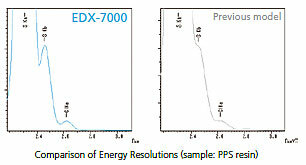 The EDX-7000/8000 instruments achieve superior energy resolution compared to previous models by incorporating a state-of-the-art SDD detector. This reduces the effects of overlapping peaks of different elements, enhancing the reliability of the analysis results. The SDD detector is electronically cooled, eliminating the need for cooling by liquid nitrogen. This frees the user from the chore of replenishing the liquid nitrogen and contributes to lower running costs. An optional vacuum measurement unit or helium purge unit is required to measure light elements (15P and below) with the EDX-7000. An optional vacuum measurement unit is required to measure light elements (15P and below) with the EDX-8000. 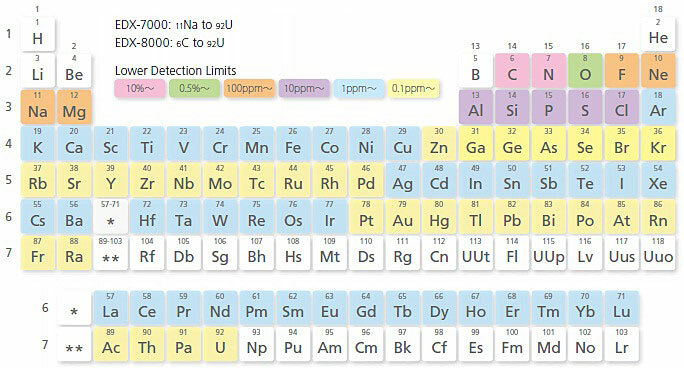 Lower detection limit vary depending on the sample matrix or coexisting elements.